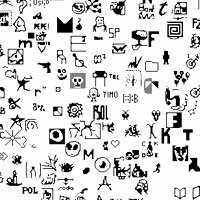 MW2MW is a collaboration between Marek Walczak and Martin Wattenberg. Started in 1997, both artists work independently but come together on long term projects such as Apartment, Wonderwalker, Thinking Machine and Noplace. 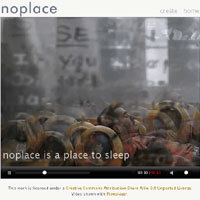 Noplace Online has launched as part of the Tate’s Intermedia series. Whether paradise, heaven or a pessimistic distopia, each of us has a vision like no place on Earth. In noplace you write a few words about that place that has not yet come into being. As your write, your words trigger a set of visual associations, colliding to form a video of your ideal. We are pleased to announce that Thinking Machine is currently installed as part of Design and the Elastic Mind at the Museum of Modern Art, New York. 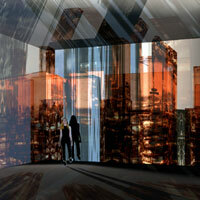 The exhibition will run from February 24th to May 12th 2008. 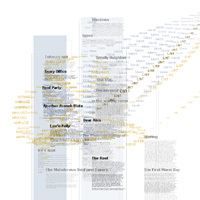 More on Thinking Machines here. 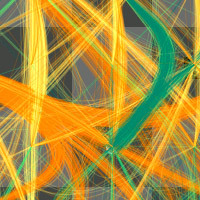 You may enjoy some screengrabs of the piece. Whatever is in your clipboard, something that’s on your mind or just a distraction, you Paste. Paste keeps track of everyone’s ctrl-V, option-V or middle-button press – these routine actions combine into a single text stream. Paste collects both trivial and profound thoughts creating a continuous scroll. The minutia of collective consciousness forms a shared narrative. A narrative that reflects personal and public history – from the horrors of war to a recipe for mashed potatoes. Everyone who has lived in an apartment has a story to tell. Gothamberg is a place to read, interact and exchange stories of lives in apartment buildings. Together, these tales of sounds and smells, lobbies and bathrooms, laundry room gossip and unexpected favors form a single collective building, Gothamberg. Their experiences form the elliptical threads of inhabitation, a mnemonic quality expressing something of the shared nature of dwelling. Noplace is an interactive installation and website that aggregates utopias into a shared vision of paradise. We are developing software that collects data, images, and texts via the web and uses these feeds to create virtual architectural structures. These structures expand as utopias are added to the project. In the final installation, projected shadows on the gallery walls represent the architecture that’s evolved from the data, creating a physical browser which viewers can manipulate and transform with a wave of their hands. Thinking Table 4 is currently on exhibit at the Banff Center in Canada as part of the show The Art Formerly Known as New Media. In this version two players play against each other using a touchscreen. 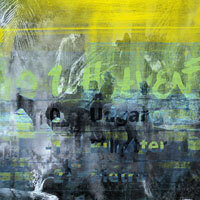 CityCollage creates a leisurely, painterly image of a single second. Your image is used as a palette that echoes the sampling of the artist’s eye. CityCollage takes your photo and uses it to build a streetscape. You become the raw material for an urban construction. As in a city, your own presence is tangential, one ingredient among many. You may not even see yourself, until a sudden moment of recognition, like spotting a familiar face in a crowd. 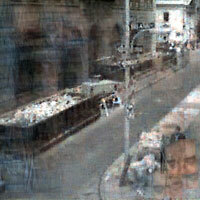 Two cameras are trained on two views, one on the street, one in a private space at the installation. Each time movement is detected in the private sphere, a new streetscape is created. Third person is a temporal mirror. Using camera recognition technology, it replaces realtime video of people at the installation with clips recorded earlier. In the present, people’s movements are ‘averaged’, a little like a Muybridge photo sequence, so that they form the canvas onto which the previous footage then plays. 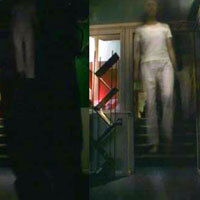 People are visible only as dark silhouettes against which, perhaps, you can see a previous clip of a figure in white descending the same staircase. Third Person was shown at the ICA, London, as well as at LMCC, 4 Walls Film Club and by appointment. Thinking Machine 4 explores the invisible, elusive nature of thought. Play chess against a transparent intelligence, its evolving thought process visible on the board before you. 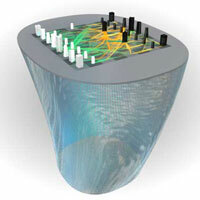 The artwork is an artificial intelligence program, ready to play chess with the viewer. 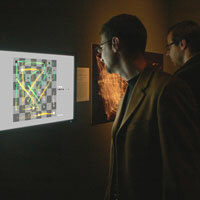 If the viewer confronts the program, the computer’s thought process is sketched on screen as it plays. A map is created from the traces of thousands of possible futures as the program tries to decide its best move. Those traces become a key to the invisible lines of force in the game as well as a window into the spirit of a thinking machine. Viewers are confronted with a blinking cursor. As they type, rooms begin to take shape in the form of a two-dimensional plan, similar to a blueprint. The architecture is based on a semantic analysis of the viewer’s words, reorganizing them to reflect the underlying themes they express. The apartments are then clustered into buildings and cities according to their linguistic relationships. A commission of the Walker Art Center, WonderWalker reimagines the 16th/17th-century Wunderkammer as a communal collection space. The WonderWalker is a collection of shared objects. Like the Wunderkammer collections of the 17th century, the map is conceived as a phantasmagoria of web objects, whose reason for placement in the collection is dependent on an independent eye.